Hilton Herbs Apple Cider Vinegar 1 Litre is a fully natural food supplement that is rich in potassium, phosphorus, sodium, calcium, iron and trace elements. Made to human grade so that it is the same as you would but in your local food shop, this Apple Cider Vinegar helps your dog to maintain excellent overall health, for a better quality of life! 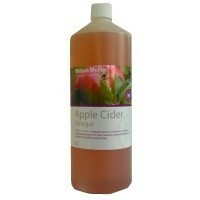 Apple Cider Vinegar (min 5% acidity).